The England international has been in stunning form for Dortmund since making the switch 21 months ago and he has racked a combined tally of 30 goals and assists. As such, he has already been touted for a big-club move with United among those interested but Zorc has simply ruled out the possibility of Sancho being sold in the summer. "I'm far from putting a price tag on Jadon, but I will say that, even for the biggest club in the world, his transfer would be difficult right now. 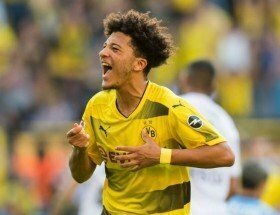 Jadon will play at Dortmund next season and we are definitely planning with him," he told Bild. Sancho is currently with the England national side for the Euro 2020 qualifiers. He recently made his competitive debut against the Czech Republic where he bagged an assist in a 5-0 rout.